Did You Get Your Google Local Posters? Home > Google News > Google Maps > Did You Get Your Google Local Posters? I Did. Did You Get Your Google Local Posters? I Did. 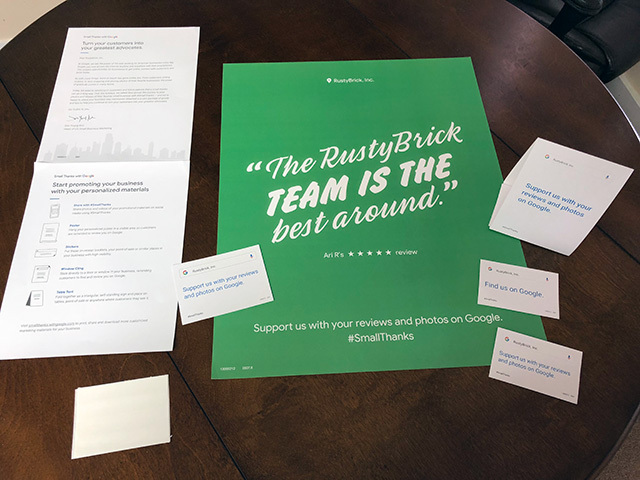 Last week, I received a massive envelope from Google with a bunch of posters and signs for my business. I got them for free by filling out the smallthanks.withgoogle.com web site. It came with one large poster, a bunch of small business card size cards, some stickers, a pop up card and a couple of letters. It was a big blue poster, supposedly for my business use, but the text had nothing to do with my business aside from a misuse of my company logo at the top. There was also several other smaller versions for display on windows, auto glass, etc. The accompanying letter said it was a free gift and that my business was a trending topic. It seems like this person did not request to receive the poster. The deal is, you can specifically request it and not only that, you can pick which review you want to highlight. So this is free, it looks free, and I doubt I will use it anywhere but hey - was a fun experiment.